Reminiscing of the sun-drenched shore of the Andalusia region, this dining room credenza features a wood toned palette that stems the rays of the sun. 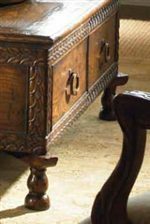 A mahogany and burl veneer interlude radiates around the smooth finished sides of this high end buffet, meeting at its center in a stunning interlaced pattern that reminisces of delicate light rays bouncing off natural flora plants. 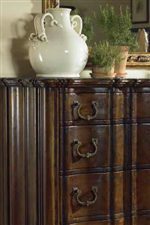 As secretive in its mysteries as the untouched layers of nature, this dining room storage cabinet features practically seamless center and side doors that open to reveal a total of five adjustable storage shelves. Perfectly proportioned for grand dining entertainment rooms, this credenza can be purchased with its coordinating display hutch completing its stunning display of natural elegance. The Marbella 661 Cielo Credenza Cabinet by Century at AHFA in the area. Product availability may vary. Contact us for the most current availability on this product. 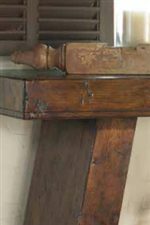 Finish The Rich Woods and Marbella Finish Pictured feature Beautiful Waxed Finishes on Hand Distressed Cases. 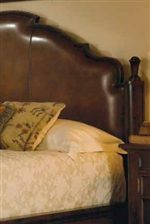 Each Piece is Unique in the way the Finish takes to the Wood, Embracing the Difference in Wood Grain Patterns on Every Item Constructed. 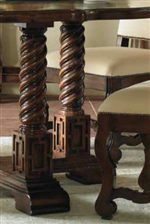 The Marbella 661 collection is a great option if you are looking for Traditional furniture in the area. Browse other items in the Marbella 661 collection from AHFA in the area.